Dramatic! Exciting! Nerve-wracking! Those are the words I've heard to describe this year's Iron Viz competition. But what was it like to be a contestant, up on stage for the entire Tableau community to see? Tristan Guillevin, Jacob Olsufka and Joshua Milligan share their thoughts about preparing for and competing in this year's big tent event. Joshua: I reviewed Storytelling with Data by Cole Nussbaumer Knaflic and also the Big Book of Dashboards. I also looked at previous Iron Viz dashboards to see what stories the contestants had told. Once I received the official data set, I spent some time exploring it and pretty quickly found a story I wanted to tell. I arrived in Vegas with the outline of a dashboard and then spent time with my sous-vizzer, David Freifeld, who had some great suggestions and really helped me improve the finished product! What was your first thought when you received the dataset? Jacob: I love working with big data sets, and am particularly attracted to demographic, US Census type data, so I was very excited to be able to work with Zillow’s data. I’ve been experimenting with implementing Pages into data storytelling to better engage the audience for a while, so I knew I wanted to try to work that into my presentation somehow. Once I saw how the distribution chart completely swung from one side to the other during the crash, I knew that I had found my story, and the map and city comparison came together off of that. Joshua: The structure of the data was the first thing that struck me as each measure and each geographic level of detail was a subset of data, so there wasn’t a really well-defined level of detail for the entire data set. The other thing that struck me was the need to understand the subject matter. I didn’t really know what the Zillow Home Value Index was or how it could be used. But as I explored the data, I realized that the structure of the data actually made some analysis easier. And as I began to dig into the stories in the data, I realized how rich the data was and how valuable the index could be in uncovering insights in the housing market. Some tricks to share to finish a complete dashboard in 20 minutes? 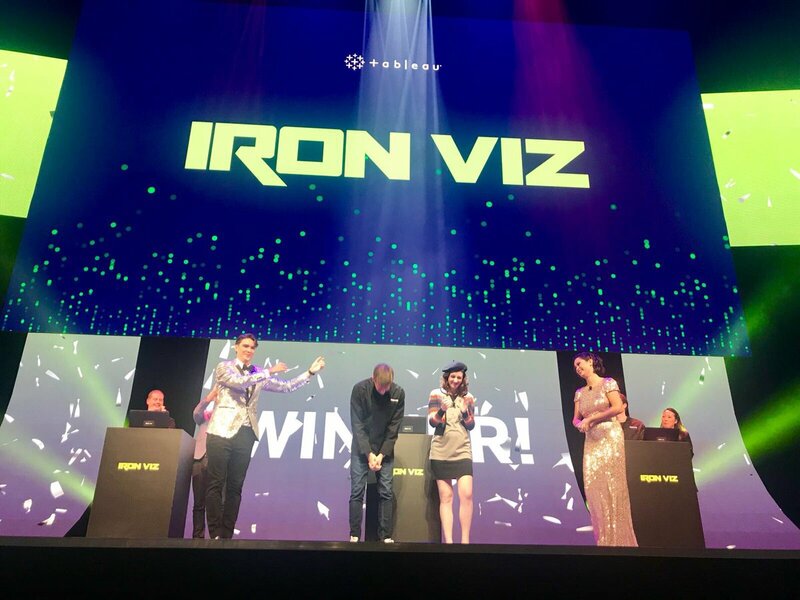 Jacob: Being part of IronViz made me grasp just how fast 20 minutes can go by, but at the same time realized that quite a bit can be accomplished in Tableau in only 20 minutes. I had almost every click and order of operations down, but I used several tricks to help make the build as efficient as possible. First off, I used the Pause Auto Updates button in Tableau so that my map only had to render once it was on the dashboard and all of the formatting and details were in place. Because I used shapefiles for the MSA areas, this took a few minutes to load in Tableau, but ended up being worth it so that we could see how the housing market shifted at a more detailed and market specific level. I took advantage of duplicating sheets to copy formatting, and used the dashboarding features of formatting all worksheet titles at once to save time. Joshua: I’ve been working on speed ever since entering Tableau’s 3-minute win contest in 2013! And the ability to create something fast is one of the things I love about Tableau – it truly is the speed of thought. There are definitely some tricks to working fast: knowing short-cuts like right-click drag and drop, copying views to retain formatting and filters, and setting default formatting and aggregation on fields. But I think one of the biggest things is to know the data set well. Knowing the data set, the level of detail and what dimensions and measures are available allow you to know what’s possible, what’s easy, what calculations or filters are needed – and know that will help you move quickly. Tell us more about the day of the competition, how did you feel being on stage? Jacob: The days and hours leading up to the competition were a combination of nervousness and excitement. Once I got up on stage the nervousness went away and I was way more comfortable then I expected, it was actually quite a thrill. I am confident that I will never feel nervous or overwhelmed by a presentation again! Joshua: It’s incredible to step out on a stage like that with thousands of people watching you and cheering you on. I found it quite energizing and exciting. I felt confident with what I planned to do, but I think there’s always a level of nervous energy when you step onto a stage like that! Jacob: Looking back I would have done more to prepare myself to be ready for anything (questions/comments) from the judges. As competitors we can use these questions as an opportunity to elaborate more on the decisions we made, and I would have been able to better respond to the specific feedback about color blindness. Afterwards I ran my viz through multiple color blindness simulators and was able to see that contrary to the feedback, colorblind people can see the distinction between the blue and orange lines. Joshua: It had crossed my mind to use the animation capabilities of Tableau, but I had dismissed it fairly quickly. Seeing the audience reaction to Tristan and Jacob’s effective use of the feature in telling an engaging story makes me look back on my choice and wonder. But ultimately, no, I wouldn’t change anything. Tristan: I came in Vegas Monday afternoon, after a 16 hours long trip. And left Thursday, just after lunch. I missed a lot of people and cool things happening during the TC. IronViz was probably a bit too much in my head. I should have allow me to spend more time enjoying being for the first time in United States with the best community! Jacob: The feeder contests are a great way to test your skills and push yourself to greatness. My advice would be to find a data set that you love working with. My best work comes when I am passionate and excited about a project, so find something that inspires you and run with it. Joshua: Have fun and never stop learning! I never thought I’d win the feeder contest. I looked at it as an opportunity to engage with the community and grow in my data storytelling. The actual contest was a blast! My advice: push yourself, engage with others, and learn from them but never lose the excitement or joy that comes from creating something new and meaningful. And listen to the advice of your sous-vizzer! Jacob: My favorite part of the competition was hanging out with the crew all day. We all were anxious, but being together and getting to know one another was a lot of fun. We were able to meet up afterwards and continue the fun night at Data Night Out. Joshua: Just hanging out with Tristan, Jacob, my sous-vizzer David, and everyone else involved in the competition. 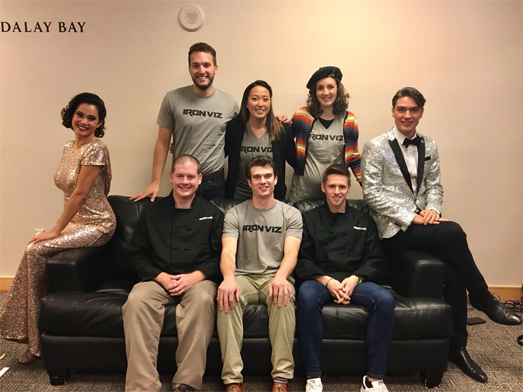 The nervous laughter and jokes and stories in the greenroom, being led in Tableau yoga by Jewel and moving along my Y-axis, being on stage, answering the judges questions – all of it combined makes for an experience I will never forget!